More Copic watercolor, you ask? Are there more ways to do it? Well heck yes! 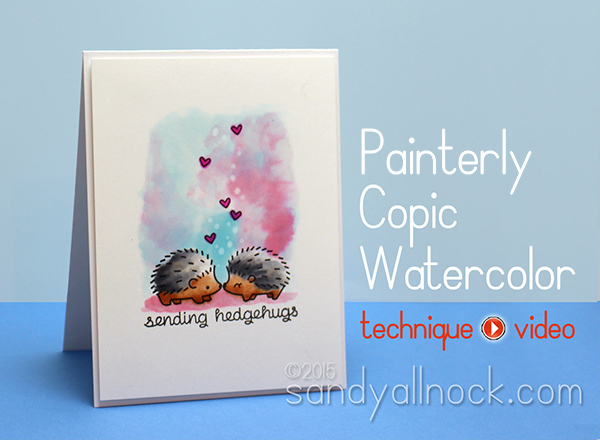 I’ve been experimenting so I can offer a variety of options for you – this one will be especially for those who like brushes and palettes for watercoloring. Enjoy the video below, or click HERE to watch it in HD on YouTube! Even with the extra bleeding that I had to work through, I love love love how this came out! In the supply list below, I’ve linked to a round palette, which I own – but shown in the video is also THIS watercolor palette too. Anything plastic with wells in it will work for this technique. By the way – some of my Copic watercolor videos seem to be garnering more “thumbs down” on YouTube – whaaa? Not quite sure what’s up with those folks. Wish they just unsubscribe if they don’t like what I’m doing. Be sure to go over and give it a thumbs up to counter them, will ya? Thanks! Below are the products featured in today’s project. Affiliate and product disclosure can be found HERE. Anyone want to take bets on whether or not I can find more Copic watercolor techniques? lol! I love this, Sandy! How do you like the Grumbacher brushes? I have 5 different sizes (1, 3, 5, 7, 10) that I have not used and am considering returning them to get the Silver Black Velvet brushes. Do you think it’s nice to have both since they may paint differently? I don’t know that I got the right sizes for card making/painting. What sizes would you recommend? Appreciate your help and advice! Since this post ages ago – I’ve switched entirely to the Silver Black Velvet. Though with other brushes, they hang around to use for things like this, since I’d never use alcohol on my silvers 🙂 Depending on what you’re painting – I never use anything under a 4 (and even that is pushing it). I’d say a 6 or 8 and a 12. Love your card. It is just adorable. Great technique video. OK, I am in full squeal mode here. I already have that stamp AND the waterbrush I ordered came in yesterday! I can hardly wait to start playing! I absolutely love your ideas, and that you experiment and show new techniques to try. The people who give you thumbs down may be the same ones who demand that certain TV channels be censored/removed from the air, instead of simply changing the channel. For some reason, I can not get this video to play. I have not had problems with any of your other videos just this one. Have you changed something? 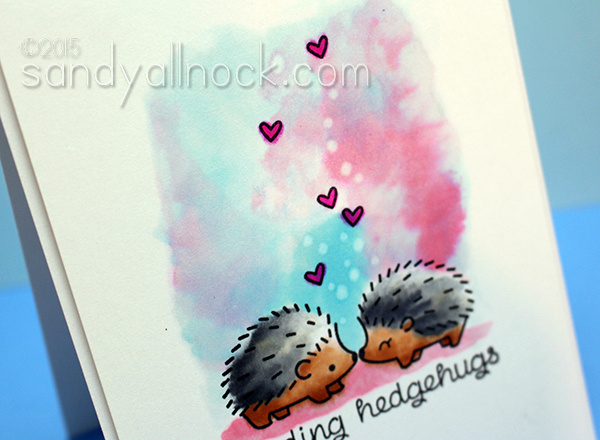 I think the card is cute and would love to see the technique used to make it. Thanks so much! Honestly don’t see how anyone could have a negative thought on this – fabulous IMHO! I just gave your video a thumbs up on YouTube. Perhaps, the naysayers are: 1) mean, 2) immature, 3) jealous ’cause he or she knows they don’t have your talent, or 4) all of the above. Everything you do is great, Sandy! Just keep doing what you’re doing. Whaaaa? Clearly those “thumbs down” people just made a mistake and hit the wrong button, they weren’t wearing their glasses, or their kids distracted them just as they were going to hit the “thumbs up” button, or there was an earthquake……. Mom words are rolling around in my head…. “Don’t say anything if you can’t say something nice”. I’m giving you two thumbs up. Adorable. Shame on those who don’t enjoy the Copic watercolors. I enjoy seeing new ways of using markers. Keep on keeping on. Need to shovel and come back for video, can’t wait to see it.